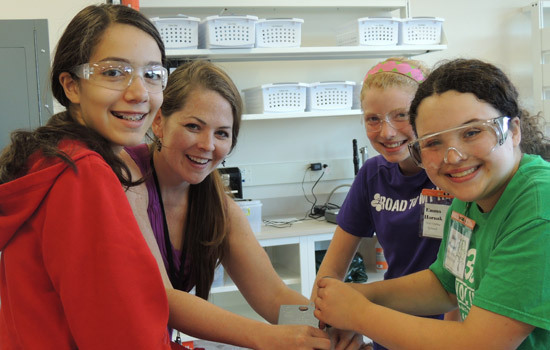 Participants in the summer Women in Engineering Camps work alongside RIT’s female engineering students on activities in labs and classrooms in the university’s Kate Gleason College of Engineering. Registration is open for engineering summer programs for girls and young women, led by the Women in Engineering Program and being held at Rochester Institute of Technology. 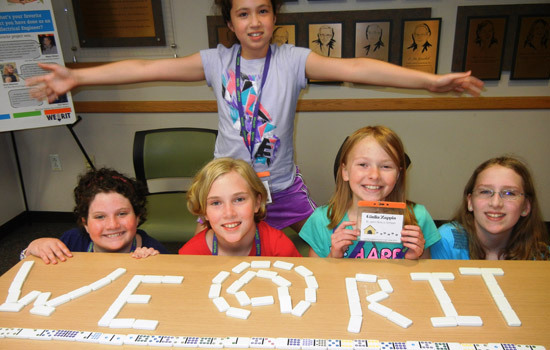 The Everyday Engineering Summer Camp, for girls entering grades 5-9, is a non-residential day program designed to spark an interest in engineering and technology fields. This year’s theme is Robotics & More. Participants engage in hands-on design and build activities, engineering lab experiences, team building and problem solving challenges, as well as recreational activities on campus. There will be two separate Everyday Engineering Camps, one taking place July 7-11, for fifth- and sixth-grade girls; another is scheduled for July 21-25 for girls entering seventh to ninth grade. The WE Explore Summer Camp is for high school girls entering grades 10-12 and is an opportunity for them to explore engineering projects and careers and to learn how engineers impact society. Camp takes place at from 1 to 5 p.m. Thursday, July 17, and at 8 a.m. to 1 p.m. Friday, July 18. Those interested can register for the camps online. Costs for the weekly program are $350; for the two-day program, the fee is $50. Participants can take advantage of early-bird registration through April 15, providing $10 off per week, family discount rates for more than two girls registered, and scholarships based on financial need through the Harris Scholarship Program. “The unique curriculum and teaching team inspires learning, promotes creativity and builds confidence and shows how engineers can make the world a better place,” said Jodi Carville, director of the Women in Engineering Program in RIT’s Kate Gleason College of Engineering. For more information contact Carville at we@rit.edu or 585-475-6321.